Here we discuss about stocks and we should buy them or not. 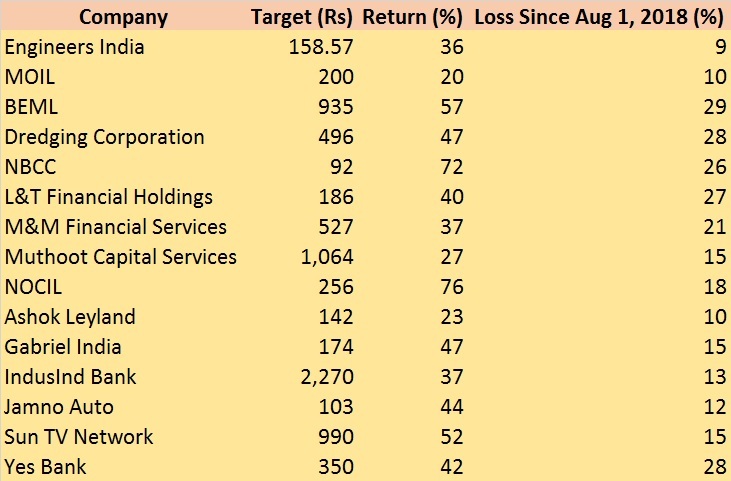 List of 15 stocks which have tanked up to 30 percent in recent turmoil and could return 20-76 percent in next 10-18 months as given by various brokerages in moneycontrol.com. Stocks with strong fundamentals for long-term investment. Ongoing capex by Indian oil marketing companies, recovering oil prices, strong order book and deal pipeline place EIL in a sweet spot. The order inflow has improved significantly in the past 2 years led by BS-VI emission norms and modernisation of Vizag refinery. Looking ahead, we expect order inflow to remain strong in domestic market which provides promising revenue visibility for next couple of years. Considering all these, we have assigned a multiple of 18 times to its FY20 EPS and arrive at a price of Rs 158.57. Viewing the growth prospects of MOIL over the next few years as steel industry in India expands its capacity and so does the company expand its mine productions over the same period, we expect the topline to grow both on the back of higher realisation as well as in volume terms. MOIL has enough internal accruals to finance capacity expansion. The EBITDA margin of the company hence widens over time while almost zero-debt levels help keep higher profit margins. We expect the topline of the company to grow more in forthcoming quarters due to increased pollution control norms imposed in China during winters, thereby supporting the domestic steel makers. Hence, we assign a EV/EBITDA (x) of 4 for FY20 to arrive at a target price of Rs 200. The increased spending in defence and railways has opened up many opportunities for the company. 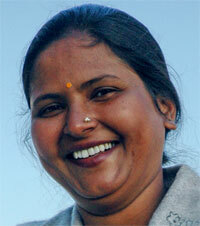 Company continues to pursue international business opportunities for increase in export business. We believe the upcoming mining policy and Infrastructure development will increase the demand for construction equipment which in turn will lead to the growth of the company. Considering these rationales, we assign PE multiple 17 to arrive at a target price of Rs 935. The Dredging market has witnessed its share of ups and downs over past decade. However, the recovery in global economy and spurt in trade has necessitated the need for expansion of existing ports, and development of new ones. Indian dredging industry has also emerged as a distinct industry due to growing dredging requirements at Indian ports and inland waterways. GOI has also proposed several measures to increase the capacity of ports. Majority of the activity would require capital dredging. DCI being the oldest player in this Industry is to benefit the most from these developments. The company is also diversifying its core business and enhancing its fleet capacity to obtain operational efficiency. Considering all these, we have assigned a multiple of 24.5 times to its FY20 EPS and arrive at a price of Rs 496. On the back of regulatory and policy reforms, improving business climate and healthy order book, we believe NBCC is poised for the steady growth in the coming years. NBCC has a strong order book of Rs 80,000 crore with 95 percent coming from PMC and 5 percent from EPC/Real estate. Given zero long term debt on its balance sheet, NBCC has no solvency issues, which is used to describe the company’s ability to meet its long-term obligations. Considering these rationales, we assign PE multiple of 24 to arrive at a target price of Rs 92. The company is well placed to accelerate growth towards retail lending with healthy margins, stronger fee income and lower credit costs. LTFH has established fee as a second line of income to counter interest rate cycle. The company has used power of digital and data analytics to unlock RoE and improved competitive position across all products. We assign a P/B(x) multiple of 2.0 (x) on FY21E book value, to arrive at a target price of Rs 186. The financing arm of Mahindra Group is primarily engaged in the financing of vehicles. The company has pan India presence & has presence in various verticals like auto financing, housing finance, insurance broking etc. The strong rural push & growth in automobile sector, will be beneficial for the company. We value the company by SOTP, and we arrive at a target price of Rs 527. Muthoot Capital Services, promoted by the Muthoot Pappachan Group, is a non-banking finance company (NBFC) based in Kochi, Kerala. Cost to income ratio stands at 50 percent which is one of the lowest in the industry. Both GNPA & NNPA have been stable at around 5 percent and 4 percent respectively. The company has strong presence in the South & is expanding it's reach on a national level. Considering the strong rural push & growth in the automobile sector, we assign a P/B of 3.2, to arrive at a target price of Rs 1,064. NOCIL is the largest rubber chemical manufacturer in India with a dominant around 40 percent domestic market shares and around 4-4.5 percent global market share. A strong 10 percent CAGR is expected in domestic tyre industry over FY18-21E. The huge capex plans announced by tyre manufacturers (around Rs 13,640 crore) and 12 percent expected growth in automobile industry is an indicator for the upcoming demand for tyres. NOCIL supplies to all tyre manufactures and hence we believe that the company is strongly positioned to capitalise the growing demand for tyres. Owing to stable margins, superior return ratios and debt free status, we have valued the company at 10x EV/EBIDTA arriving at a target price of Rs 256 per share. Pre-buying before the BS VI implementation in April 2020 to result in a spur in demand and hence buoyancy in truck sales. Various infra structural developments in the country may lead to the continuity of current growth momentum in H2 FY19 as well. Upcoming elections in 2019 may push MHCV sales on the back of GOI expediting infra reforms. Axle norms implementation may pull down truck sales to some extent in the ensuing months, but the intrinsic demand strength may well offset this pull down. Continuous gaining of the Defense orders (around 10 percent of topline) from GOI, strong exports penetration (10 percent of topline), wide AfterMarket (AM) penetration market (20 percent MS) are further positives. Operating leverage, price increase taken and improving product mix (in favor of higher tonnage trucks, exports, AM and Defense) may counter raw material price hikes, from margins point of view. At 13.7x times FY20E earnings, the stock looks extremely attractive from a mid to long term view. A strong player in the automobile shock absorber space with a wide spread clientele across the verticals of the automobile industry. No single client concentration as TVS is the biggest client with 20 percent contribution to topline followed by MSIL. Single source supplier to the likes of Vitarra Brezza, Ignis, S Cross, KUV 1oo, XUV 5oo, Scorpio, Bolero and second source supplier to Alto, Wagon R, Tiago, Tigor and most of the 2Ws from Bajaj, Yamaha, TVS, Suzuki, HMSI and RE. Gabriel wins a duopolistic contract to provide to the Alto replacement to be launched next year. This is a big opportunity which may allow the company to gain market share in PVs. Rapid increase in dealers and touch points in the AM business (40 percent MS) and increase in traded auto parts (10 percent of AM topline) to help margin growth. Clean balance sheet, minimal debt, high return ratios (more than 20 percent) makes the investment case stronger. Attractive valuations of 12.5x times FY20E EPS, provides a good entry opportunity. There is potential for margins to improve from current 3.95-4 percent led by - 1) Change in the portfolio mix more in the favour of high yielding retail assets. 2) Higher corporate credit demand (which earlier had got shifted to bond market). 3) Opportunistic demand coming from better yielding refinancing options in NCLT cases, 4). Potential for SA rates moving down. Productivity improvements are likely and merger of Bharat Financial would be best fit into the bank’s product suite. Sustained strength in the asset quality will continue – Asset quality profile to remain robust as we expect credit cost of 55-60 bps in FY19E similar to last year levels. Valuations - Return profile is likely to improve for better – we estimate ROE to improve to 18 percent in FY20E from 16 percent in FY18. We recommend a Buy rating on the stock with a TP of Rs 2,270. The company is trading at 3.6x & 3x FY19E & FY20E ABV respectively. Jamna Auto is a market leader in leaf springs used in CVs and globally #2 in this business has got a wide array of clientele. It has strong market share of 73 percent in the leaf springs space and 95 percent in parabolic leaf springs space. The company earns 83 percent of its topline from OEMs and hence is proxy to the CV upcycle. Tata Motors sources around 73 percent while Ashok Leyland sources 91 percent of its requirement from Jamna. Widening distribution network, increasing tie-ups with retailers and garage personal and growing aftermarket exports are positives for the replacement business (10-15 percent market share). The company is doubling its parabolic spring (25 percent of volumes) capacity which would in turn provide it with higher volumes and margins. Higher emphasis on Infraprojects by GOI, pick up in mining activity, demand from some of the big corporates to update the CV fleet and possible implementation of ‘cash for clunkers’ scheme will ensure CV sales remain on fast track. Jamna is EV agnostic. Clean balance sheet, zero net debt, high return ratios (between 30-40 percent) makes the investment case stronger. At inexpensive valuations of 12.6x times FY 20E EPS, it is a good investment opportunity. The South Indian broadcaster with significant presence in 3 out of 4 states (AP & Telangana, Kerala, Karnataka) and market leader in one (TN). Improving content, shift to commission model, market share betterment in key markets like TN and AP to maintain around 15-20 percent advertising revenue growth. New channel launches like GECs in TN and AP and entry into Bangla and Marathi to provide the delta in advertising revenues. Big opportunity lies in the Subscription business as 50 percent households (8-10 million) in TN are yet to be digitized under Phase III and IV which would provide volumes as well as ARPU growth. Upcoming 3 blockbusters in second half of FY19 (one which includes Rajinikanth) will lift up Movies business of Sun to a great extent. IPL business revenues has great potential to grow from here with topline growth moving up with more title sponsors, gate revenues, performance related prize money, agreement with BCCI, popularity of IPL and reduction in franchisee costs. At 15.6x times FY20E earnings Sun TV provides attractive risk-reward. Management succession plan is underway. In the recent developments, the bank's board has formed Search & Selection Committee (SSC) in order to find replacement of CEO. In the recent conference call, the management has reiterated its growth & asset quality outlook. In this turmoil, stock is corrected by nearly 50 percent from its peak levels. We view the present uncertainty as an opportunity till the new CEO takes charge. Yes Bank market share has improved considerably from 1.3 percent to 2.4 percent over the last 2 years in total systemic credit. Share of AAA rated customers in total corporate book has increased substantially from 17 percent to 23 percent over the last 6 quarters. Competitiveness of the bank has improved and there is room for margin improvement from current 3.5 percent. Given the recent correction, it is trading at attractive valuation, hence we retain Buy rating on the bank with a TP of Rs 350 (target multiple of 2.3x FY20E ABV).